From our Beaded Drop Collection: The beads in this beaded fringe are a very pale and neutral camel color - the very traditional color that you find so often in home decor and color schemes. It is absolutely beautiful and will go with almost anything because the color is so muted. 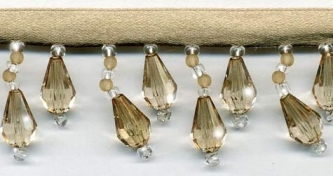 Pale camel colored faceted teardrop beads with seed beads in pale beige and crystal clear. This beaded fringe color is one of a kind! This is a high quality, very full beaded fringe with exceptional detail and craftsmanship. The longer beaded stands are 1" long, not including the dark ivory satin ribbon. Perfectly stunning! Perfect for apparel or home decor.